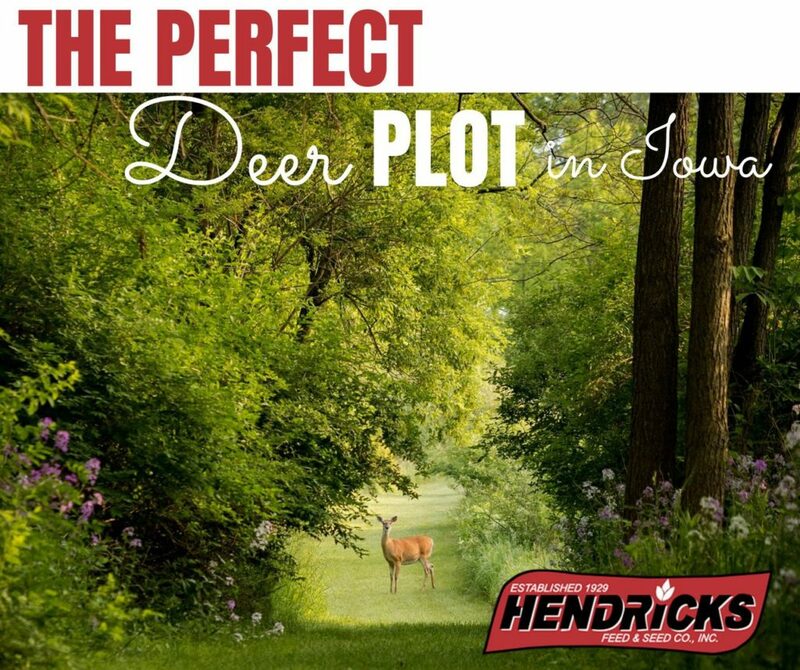 Hendricks Feed & Seed Co., Inc can help you create the perfect deer plot with products perfect for our area of Iowa. While you need to consider things like size, location, and wind direction, we can help you figure out what to plot and why it would be effective. We also suggest this great article from Field and Stream: https://www.fieldandstream.com/articles/hunting/2012/06/how-create-perfect-deer-plot. Remember, your deer plot doesn’t have to look perfect, but with the right touches, you can attract deer easily. Here are some product suggestions to get you started! Why it’s effective: It is a great food source that will sustain the draw of your deer plot through late fall and winter after the tops are gone. To best attract deer in late fall, plant our Brassica Blend anytime from late summer to early fall at the latest. What it is: Our most popular clover food plot blend. Blended with six different types of legumes and chicory. Why it’s effective: This Clover mix is a perennial blend of our red and white clovers with our variety of chicory. It is the perfect mix to make sure that for the local deer, the attraction becomes an obsession. The mix includes Jumbo Ladino, Rampart White Clover, Kopu II Clover, 990 Elite Red Clover, Antler Chicory, and Winter II Alfalfa. What they are: A special blend of buck forage oats that has been scientifically developed and tested for use in deer plots. Why they are effective: Our special blend of forage oats yield a tender, highly palatable, cold and drought-resistant crop that attracts deer throughout the fall. For best results, plant in a well-prepared bed. The 50-pound bag can cover half of an acre. What they are: Our Newbie Sugar Beets are of 99.99% purity. Why they are effective: It’s a proven fact that deer love sugar beets. It’s a great addition to any deer plot. Deer are known to eat the leafy tops but they will also dig for and eat the roots of the sugar beets. Whitetail love sugar beets! What it is: Trophy Rock is a natural macro and micro trace minerals lick used for big game hunting, observation, and herd management. It is a great deer attractant. Why it’s effective: Trophy Rock is the most effective all-natural mineral supplement available and serious hunters swear to us they’ve never used a better product. Trophy Rock provides deer with essential natural macro and micro trace minerals. It also attracts and holds deer on your hunting property. It is a fantastic scouting tool when used in combination with trail cameras. What they are: Buck Monster is the exceptional forage wheat variety for your deer plot. Why they are effective: Buck Monster plants are tall, featuring large, long, and flashy seed heads that produce excellent quality grain that is effective for your deer plot. What they are: Broadside is a highly innovative fall deer plot blend featuring superior plant genetics. Why they are effective: Broadside is like a “time-release” food plot delivering different plant species to give your deer plots palatability and attraction from early fall, through the winter, into spring. Soon after planting, our highly attractive forage soybeans bring the deer to you. What they are: Austrian winter peas are a cool-season annual legume that has long been considered a high-preference forage for whitetail deer. Why they are effective: Due to its nitrogen-fixing ability, winter pea has numerous agricultural uses, and it is very easy to establish in fall deer plots. They are beautiful and a natural deer attractant. Whatever your special mix is for your deer plot, the products above are sure to produce great results. We hope you will share your success stories from your deer plot with us. Here’s to a great deer season!